Adam Lambert & Muse Mashup: Better Than I Know My Madness – SOOO Badass! You are here: Home / More Featured Posts / Adam Lambert & Muse Mashup: Better Than I Know My Madness – SOOO Badass! @muse is one of @adamlambert’s favorite bands. He covered their version of Feeling Good on American Idol and Starlight on the Idol Tour. If you’re a fan and especially if you’ve seen them live, you may be aching for a duet. A couple of weeks ago, Lila and I saw Muse twice in Los Angeles, and we hoped Adam was in the audience, or even better, would come onstage for a killer duet of Feeling Good. The megaphone was on Matt Bellamy’s piano and a girl dream, right?! But no luck. Until this pairing happens, here’s the next best thing. Adam just tweeted about this mashup of Better Than I Know Myself and Muse’s Madness, from their newest release The 2nd Law. If you haven’t checked this band out yet, now’s the time. Have a listen at a few of their songs off YouTube, then go download them and make a fantastic playlist. The thrill of discovering new artists is probably something every Adam Lambert fan has in common. Get ready to have your socks rocked off! Who knows? Maybe this will give Adam some inspiration for his next CD?! Thanks to SmadaLeinad for the amazing mashup. I would love to see Muse. I also love Linkin Park because they also have a great lead singer. Adam is still my fav and I’m bummed and fear I won’t have a chance to see him live again. What could he be up this summer? He killed it with Queen and I’m still hoping. I wish Matt would give Adam another song for his next album or better yet, write one with Adam. Thanks for the post. I will be bummed if Adam doesn’t do much this summer. I had such high hopes. This is brilliant! Muse does tend to be tougher than Adam and yet somehow soul mates. I loved Starlight on the Idol Tour – downloaded every version from every concert and painted two paintings inspired by Adam and that song. Yes, I’ll sure vote for any and all collaboration between Muse and Adam. 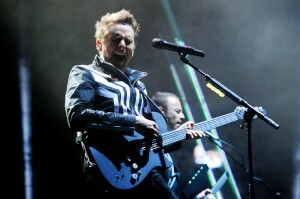 Although Adam is my favorite singer, MUSE is my favorite band. They have also found a prominent place in my soul. This is a fabulous mix, thanks to everyone for creating and sharing!